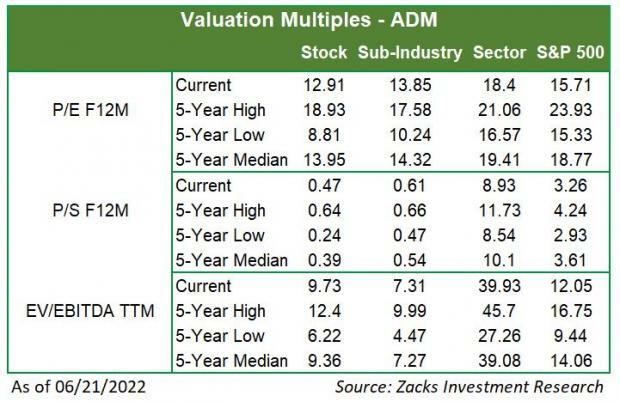 Archer Daniels Midland Company ADM is an appropriate investment option as the Illinois-based company’s shares have outperformed the industry and the overall Consumer Staples sector in the past month. This Zacks Rank #1 (Strong Buy) stock has rallied approximately 15.6% compared with the industry’s growth of 6.8% and against the sector’s decline of 5%. That said, let’s delve into the factors that make Archer Daniels a promising bet. Archer Daniels is making efforts to improve its portfolio in the Nutrition space. In this regard, the company has agreed to buy Rodelle Inc. to widen its range of vanilla supplies. Earlier, it agreed to acquire France-based Neovia, which provides value-added animal nutrition solutions for the feed industry. Also, the company has signed a joint development agreement with Chinese biotech company — Qingdao Vland Biotech Group Co., Ltd. — earlier this year. Management also remains focused on five major platforms — animal nutrition, health & wellness, carbohydrates, human nutrition and taste. The company also depends on its access to various geographic regions to drive growth. Moreover, to streamline its portfolio, the company has undertaken few divestitures including offloading the Crop Risk Services insurance operations to Validus; the sale of its stake in Australian grain handler, Graincorp, and the sale of its chocolate business to Cargill, among others. Management has also completed the divestiture of its Oilseeds operations in Bolivia to Inversiones Piuranas S.A.
Archer Daniels remains focused on strengthening its business through increased cost savings. The company targets additional run rate cost savings of $550 million over the next five years, including cost savings of $350 million from operational excellence and process enhancements, and about $200 million in incremental purchasing savings. In the first six months of 2018, the company generated operational cost savings of more than $150 million on a run rate basis and is on track to exceed the targeted $200-million savings for 2018. Archer Daniels has long been enhancing operational efficiency of its production and supply-chain networks to curtail costs. Also, the company has been on track with its business transformation under its 1ADM program, which forms an integral part of Project Readiness. The company expects Readiness to help management have a more coordinated approach toward driving the business, standardizing functions and enriching consumers’ experience. Further, as part of this plan, the company intends to allocate resources efficiently to more mature businesses and make prudent business investments. The company has rolled out the 1ADM program to ocean freight and European corporate finance operations. Going forward, it remains on track with further 1ADM rollouts to cover the entire enterprise in 2018. Archer Daniels has an impressive surprise history. Second-quarter fiscal 2018 marked the company’s third straight positive earnings surprise and second consecutive sales beat. While the top line gained from solid sales witnessed across all segments, the bottom line was aided by higher sales and adjusted segment operating profit along with lower tax rate. Also, Archer Daniels’ strategic initiatives and cost-saving efforts boosted performance. Additionally, the company remains confident about delivering impressive results in the second half of 2018, backed by improving market conditions, higher global demand, gains from U.S. tax reform, product innovations and Project Readiness. Going by segments, management expects Origination, Oilseeds and Nutrition results to improve in the third quarter on a year-over-year basis. All said, we are optimistic that Archer Daniels’ growth plans will sustain the company’s stellar show. Medifast, Inc. MED has a long-term earnings growth rate of 20%. The company sports a Zacks Rank #1. You can see the complete list of today’s Zacks #1 Rank stocks here. Calyxt, Inc. CLXT pulled off a positive earnings surprise of 7.4% in the last reported quarter. The company carries a Zacks Rank #2 (Buy). Conagra Brands, Inc. CAG has a long-term earnings growth rate of 8%. The company also has a Zacks Rank #2.